Please ensure you have correctly Identified the correct ER type of Nut/ToolHolder and the Direction of Rotation prior to ordering. 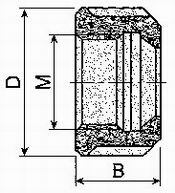 Dia=50mm B=23.0mm M40 x 1.5 Max RPM=50,000 Wrench Torque 125 ft/lbs. Dia=63mm B=26.0mm M50 x 1.5 Max RPM=40,000 Wrench # Torque 140 ft/lbs. 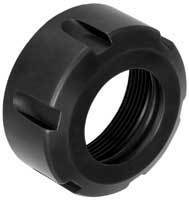 Dia=50mm B=26.00mm M40 x 1.5 Max RPM=50,000 Wrench Torque 125 ft/lbs.